Tonight's episode of The Flash, titled "Gorilla Warfare," featured a surprise for fans: the first look at Hawkgirl with her wings extended. 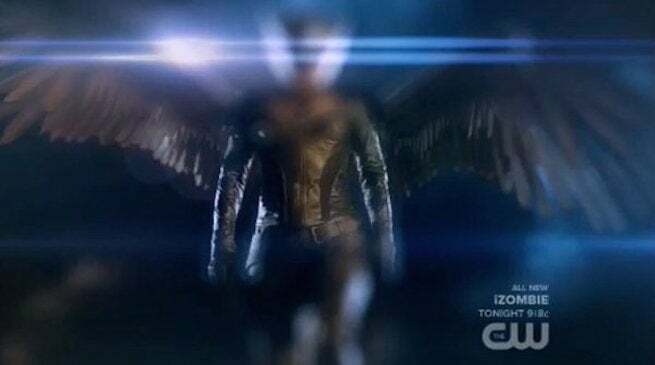 We've seen a number of shots of Hawkman and Hawkgirl now, ahead of their big debut in the forthcoming Arrow/The Flash crossover episodes, but none of them have featured the characters' wings. Ironically, when Cisco "vibed" on his date Kendra Saunders tonight, he saw the wings...but not her face, so that he could figure out it was her. And while he thought at first it might be a man, fans will know its Hawkgirl becuase she has sleeves. You can see the image above. UPDATE: We're adding a gallery below, featuring some clearer shots, which helped Cisco to figure out just who he was seeing in that suit, below.